What ho, my many loyal Munchkin friends? The other big news is progress on the Munchkin Collectible Card Game. Thanks to heroic work by Devin Lewis, Sam Mitschke, and Randy Scheunemann, the text for all the cards in the first core release is done and in to production! All of the art is also complete, and they are now working on finalizing the rules and the design of the packaging. Devin has also been hard at work editing the cards for the first expansion wave. Developing a CCG is a lot of hard work and we've all learned a whole lot of game-design skills as this has lumbered toward game shelves, but we are pleased with the result, and we're pretty sure y'all will be, too. Now that all the Shakespeare stuff is taken care of, everything for the 2017 Munchkin schedule is at print, on its way to us, or already in our warehouse. This is by far the earliest we have ever hit that milestone, and it's a testament to the hard work of many people here at SJ Games and our talented freelancers. Thanks, team! If you missed the announcement of the Unrivaled tournament series, check it out here. We're looking forward to finding out who the best of the best Munchkin players will be! 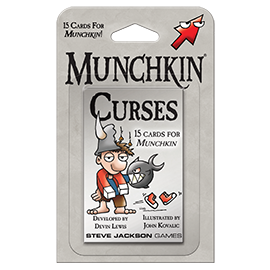 We've also got a new booster hitting shelves in April: Munchkin Curses. You can find it at your friendly local game store this week! That's it for this month! I'll be back in May with more news from the world of Munchkin.